TALKEETNA, JULY 1997 - Seeing Mount Mc. Kinley was one of the things I dreamt about before coming to Alaska. Native Americans used to call this mountain 'Denali' ('the great one'). The name is absolutely appropriate - with its 6194 meters this mountain is not only the highest in North-America, measured from the lowlands that surround it, it has a vertical relief considered being the highest in the world, even higher than that of Mt. Everest. "Wow, this must be an awesome sight", I thought, already in dreams standing on the grassy lowland looking up to the mountain... There's only one little warning : you have to be lucky to see it. Chances seeing this giant are one out of three, at other times there's nothing but clouds. 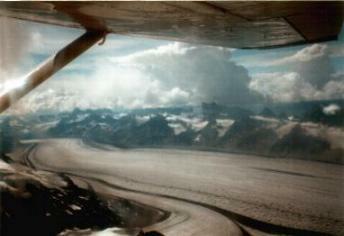 I was lucky to see a glimpse of the mountain top during a plane flight - later in the Denali N.P. the mountain did not show it's grandeur anymore to us... From the town of Talkeetna, there are several companies offering a trip of half an hour to a couple of hours with a small Cesna-like plane. Such a flight is a true adventure. Taking off from the 'landing strip' (and landing hopefully) is quite 'bumpy' and sometimes the 'runway' is made of gravel. The little plane brings you above tundra landscapes with glacier rivers, across huge glaciers and between the peaks of the Denali mountain range. It's really spectacular and sometimes you wonder how the pilot manages to fly over some peaks or fails not to touch the rocks when flying through some small passages. 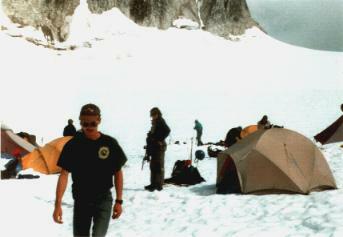 I took a trip with included glacier landing to a place near the basecamp mountaineers use to climb Mt. Mc Kinley. 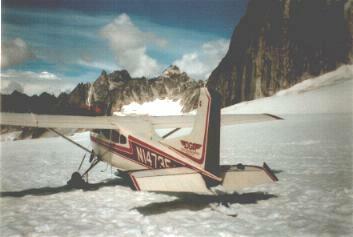 The landing is not always possible as the plane must be able to take off again (the snow that covers the glacier the plane lands on, must be solid enough). Our pilot decided he could manage but only when using the 'skis'. When we had landed, we could wander around a little to go and visit a camp made by mountain climbers, which were practicing mountain survival skills. They were brought up here by plane, but would have to hike down again as glacier landing would not be possible anymore soon, when mid-summer arrived.